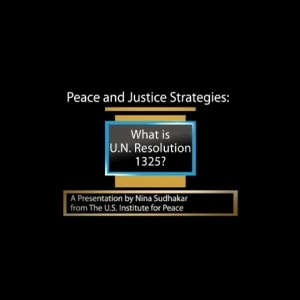 Peace and Justice Strategies:What is UN resolution 1325? Montgomery College Television Arts & Humanities	 A Presentation by Nina Sudhakar from The U.S. Institute for Peace. A Presentation by Nina Sudhakar from The U.S. Institute for Peace. Embed "Peace and Justice Strategies:What is UN resolution 1325?" on your page.